We are in well into the beginning of summer and in the end of Iced Tea Month. The weather has already warmed up and many have switched from their standard hot tea to iced tea. Independence Day (also known as Fourth of July) is upon us and so many us of are either preparing for a big barbecue or are going to one. Others are just trying to escape the unbearable summer heat. What other way to escape the heat than ice pops? What if I said you could use tea in your ice pops? It may sound crazy but it’s a very refreshing idea. You could use tea alone or you could add whatever else you want, like fruit or juice. All you simply need is a mold (and a few popsicle sticks if your ice mold is like mine). Simply brew your tea, any kind you like, and just let it cool. Once you are finished brewing and cooling, fill the molds so they don’t overflow and freeze. 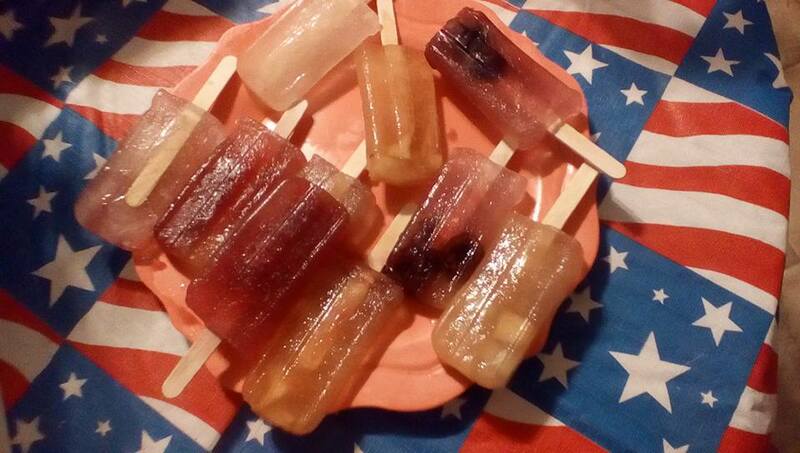 Every ice pop mold varies, so your ice mold may come with sticks or you may have to buy them separately. Once filled, freeze overnight for best results. To release from the molds, fill a bowl, pan, or container that is at least as tall as your mold with warm water and dip ice mold with pops in for about 20-30 seconds until the pops loosen. If you still have a bit of trouble getting them loose, dip them again. They should come out. Serve and enjoy! For just a few of my flavors, I used a few flavors like Tangiers Lemon White Tea mixed with Lemonade, Pomegranate Hibiscus Green mixed with Pomegranate juice, Hawaiian Colada Rooibos with some fresh cut pineapple, and Bingo Blueberry with fresh cherries. It’s perfect for everyone, including children! Bonus idea! Freeze tea so you can add it to your iced tea instead of plain ice without watering it down! Perfect for enjoying in the shade with family and friends or by the poolside.